When we were at the iRenew Expo, we had several people tell us that we MUST go to Fairfield on the tour…so we adjusted our schedule and went there during our Iowa City stop. It’s a short jaunt down there from Iowa City…through cornfields and flowers. It a virtual hot bed of freethinking people…which is kind of strange to find in the middle of Iowa. 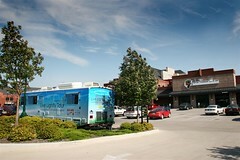 We arrived and parked at Everybody’s Whole Foods from from 11am-2pm. We were able to talk with a variety of passersby coming to eat during their lunch hour. I was excited to find so many locally produced foods within the coop. Before we left, I bought some delicious organic cheese (the best cheese I’ve ever had…from Radiance Dairy. Yum), chocolate soy pudding, and hummus…all made right in Fairfield! We had contacted Lonnie Gamble before we arrived and he was able to come down to say hello. 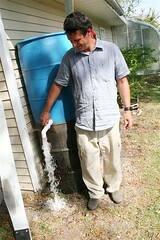 Lonnie is very well-known around Fairfield and has extensive experience in the area of sustainable living. Lonnie is an engineer, educator, farmer, and community activist. He is the founder of Abundance Ecovillage and Big Green Summer, a 10 week summer intensive in sustainable design, where students live what they learn. He is a founding director and co-chair of the non-profit Sustainable Living Coalition. He is a founding faculty member in the four year Sustainable Living degree program at Maharishi University of Management in Fairfield, Iowa. Lonnie’s professional qualifications include a degree in electrical engineering professional engineer license. His interests include renewable energy, the efficient and wise use of energy, local organic food systems, artisan foods and the slow food movement, natural building, permaculture design and local alternatives to the global economy. He is the founder of five companies in the areas of renewable energy and telecommunications. He speaks and writes regularly on issues in his area of interest. He llves with his wife Valerie and their daughter in a strawbale passive solar home, where they harvest rain for water supply, get their electricity from solar and wind power, and eat something fresh every day from their extensive gardens. They haven’t paid an electric bill in 15 years. Click here for writings by and interviews with Mr. Gamble. (bio link). He came to tour the RV and also to interview us for his radio show, Abundant Planet. He also gave us a tour of the facilities at Maharishi University, where he teaches in the sustainable living program. The program is the only 4-year degree program in sustainable living in the country. They are doing all kinds of cool things there…rainwater catchment, biodiesel production, solar projects, wind turbine projects, “slow” food projects…The buildings are under construction right now, but we were able to see a photo of what the finished project will look like. It’s rare to meet a man of such passion and direction…we were encouraged by his commitment to his family, students, and his community. The BioTour guys made a stop in Fairfield during their tour last year…you can read about their experiences here. They were able to spend a longer amount of time there and they give a great description of all Fairfield has to offer. Our first stop of the tour was Iowa City and Coralville, IA. We had amazing weather…..weeeeeee! Our demo was located at the New Pioneer Co-op in Coralville…they were very welcoming and even gave us a $20 food credit to eat supper. Yum. We are actually members of the New Pi and have loved their good eats for quite awhile. Coralville is near and dear to our heart because we were staying at a hotel there a couple summers ago when we had our “live smaller” epiphany! While there, we were able to meet several people that we had only met online…Matt of Groovy Green, Kesa and her girls, Tara and the boys….it was great to put names and faces together! We had lots of other people stop and learn about veggie…spreadin’ the love. I was also able to have a “mama night out” with my cousin Trish…we went to the Red Avocado and then to a Ani DiFranco concert (where I promptly got my camera taken away for snapping a photo of the opener, Melissa Ferrick). What fun! Melissa was such an AMAZING performer…I was mesmerized! She has a very similar style to Ani. I have been wanting to see Ani in concert for quite awhile, and it was definitely worth it. Delicious stuff. She swears a bit too much for my liking…but she’s such a talented artist and poet. She has a dedicated cult following, and we had fun watching the rather large man with the huge gotee in the front row dancing throughout the ENTIRE concert. By himself. That’s some serious love for Ani. We stayed with the wonderful Joe and Tara while we were there. Bella and their son Liam had a great time playing together. They have a one month old little boy, Atticus, as well. He was squishy and squeeky, and all baby. Joe and Tara are both musicians and play in a group called The Beggarmen. Tara teaches Irish fiddle lessons from her home as well. Be sure to check out their newest CD, Newry Town.